By the time I got to the Miyabi part, the fourth (I think?) talk segment, since I didn’t know what I was going to say until I actually started talking, I just ignored any mistakes and just kept going! I think that worked out way better. BUT, near the very end, I accidentally moved my mic so I did have to rerecord the end since you couldn’t hear me in the original. >_>;;; It happened in the middle of a sentence too! Oh, and about wotachat…I really don’t know what I was saying there. xD But I meant it about everyone going there! It’s on IRC, connect to the Rizon server, and join #wotachat. Edit: Almost forgot. 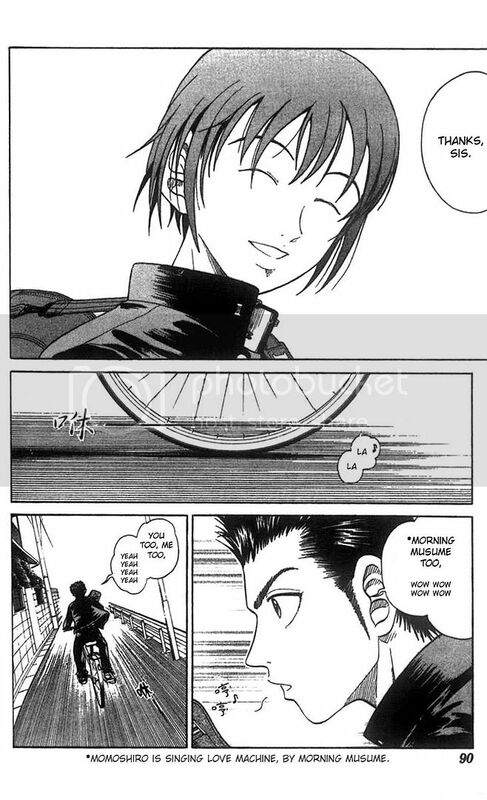 This was the Prince of Tennis manga page I was talking about, where Momo sings LOVE Machine. It’s the scanlation though, not the Viz English translation.